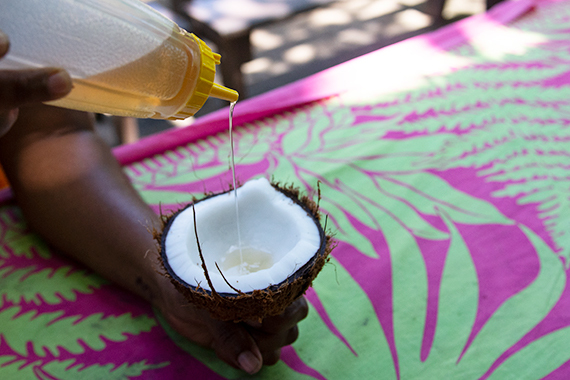 “The [coconut] oil is something we still use until today in different parts of Fiji for a lot of things in our culture — cooking, body lotion, medicine and healing wounds among them. For example, our people mixed it with charcoal and used it to help tattooing heal faster,” said Kalivati Volavola, the Fijian cultural ambassador for the Polynesian Cultural Center. Volavola, who is from Nabitu in the Tailevu district of Viti Levu, Fiji’s main island, first came to Laie in 2007 to attend Brigham Young University–Hawaii and now works full-time for the Center. 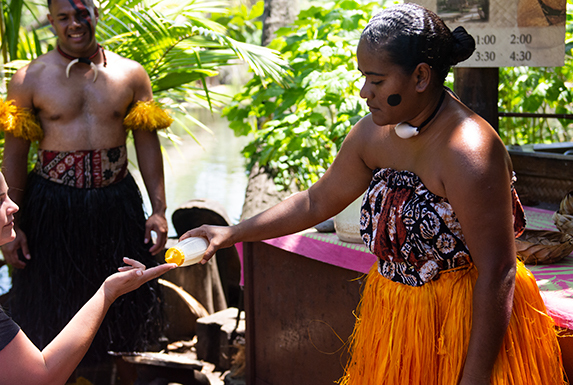 Young Fijians share how they make coconut oil at the PCC and use the oil to cook and to make a scented coconut oil that’s been used for health and beauty purposes across Polynesia for centuries. Fijians call the oil waiwai. 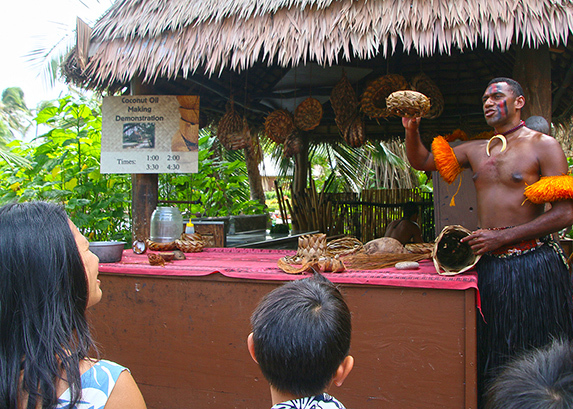 A Fijian guide at the Polynesian Cultural Center demonstrates some of the useful items made from the coconut tree or “tree of life,” as it is often called in Polynesia. Waiwai smells good and has several health benefits. It’s sold in the markets in Fiji, but some Fijians still make theirs at home. Volavola introduced Nunia Yadraca, one of the students in the village from Somosomo in Taveuni, Fiji, who is responsible for making waiwai. Collect mature (i.e. brown) coconuts. “We had a lot of coconuts on our farm. Both the boys and girls would gather them. We had a lot of fun doing that,” Nunia said. The coconuts need to be husked, cracked and scraped. “The finer you shred the meat, the more ‘milk’ it will give,” Volavola pointed out. The shredded coconut meat is squeezed through a cheesecloth to extract the creamy milk. 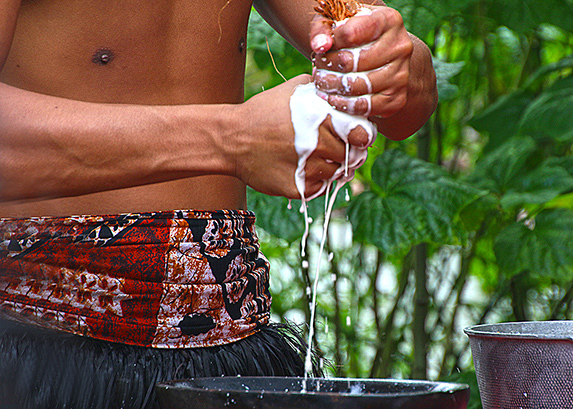 A Fijian Villager at the Polynesian Cultural Center places grated coconut meat into a coconut husk strainer and squeezes out fresh coconut milk — so called for its white color and creamy taste. It is from coconut milk that the oil is extracted. “Collect this in a bottle and let it stand. The coconut oil, which is lighter than water, soon separates and rises to the top. After a while, it curdles.” Nunia said some people accomplish this phase in as little as one day by putting the coconut cream in the sun. Others let the separation process go on for up to two weeks, trying for some akin to “extra virgin” quality. “We next skim off the curdled coconut oil and put it in another bottle, and we discard the water,” Nunia continued. “Spoon the curdled oil into a pan and boil it for one-to-two hours over moderate heat (pictured below), so it doesn’t burn.” Note: “Add flowers during this stage to enhance the scent of the oil. If you burn the mix, that will change the smell,” Nunia said. 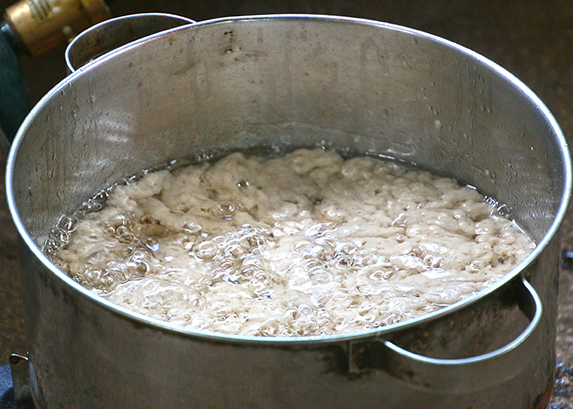 Nunia boils the curdled oil separated from coconut milk for one-to-two hours on low heat to prevent burning. Nunia indicated further separation takes place during the boiling phase. She then lets the clarified oil cool, and then strains it through cheesecloth into another container. 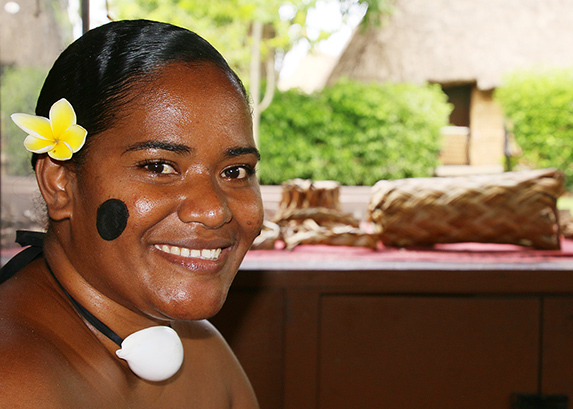 Visitors can sample waiwai at the Fijian Village demonstration when visiting. Demos are at 1:00 PM, 2:00 PM, 3:30 PM, and 4:30 PM. Brave souls could probably even try to make their own following the procedures above, or go to the Polynesian Cultural Center’s online shop and order a bottle of the Tahitian variety — Monoī Tiaré Tahiti (with a Tahitian gardenia scent). It’s very similar to Fijian waiwai. Story and photos by Mike Foley, who has been a full-time freelance writer and digital media specialist since 2002. Prior to then, he had a long career in marketing communications, PR, journalism and university education. 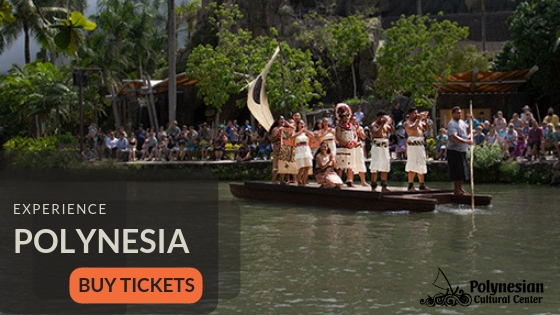 The Polynesian Cultural Center has used his photos for promotional purposes since the early 1970s. Foley learned to speak fluent Samoan as a Latter-day Saint missionary before moving to Laie in 1967, and he still does. He has traveled extensively over the years throughout Polynesia, other Pacific islands, and Asia. Though mostly retired now, Foley continues to contribute to PCC and other media. 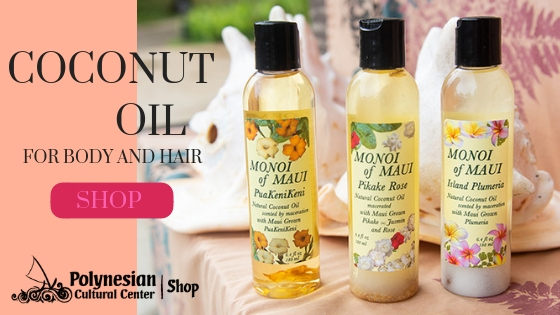 He first used Samoan coconut oil, which is very similar to Fijian waiwai, for health reasons over 50 years ago.